How to convert between shoe sizes from the UK, US, and EU? How can I use the shoe size converter? Whether you are shopping online or buying shoes during holidays abroad, this shoe size conversion tool is for you. It may serve as the US to UK shoe size converter, may help in shoe size conversion from women's to men's or changing the sizes for children shoes. 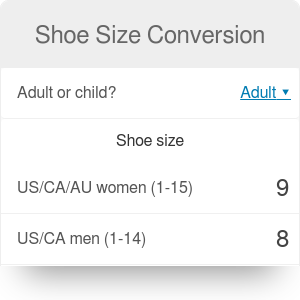 Remember, that the values shown in our conversion tool are a popular standard, but many shoe manufacturers may have its own size conversion table. You can find different conversion charts in the web, but actually, the equations for the conversion exist! Isn't it awesome? We do not give the formulas for EU children, as there are couple versions and the size conversion table is customary. Also, the UK/US sizes for children differ, but the ones presented are among the most popular. You can enter whichever value you want, and the converter calculates the rest. Let's suppose that we were looking for the UK to US shoe size converter, and we want to find the shoe size equivalent for a woman with 10 UK shoe size. At first, you need to choose for whom you want to do the calculations - adult or a child, as the formulas differ. We select a woman in our example. Type the shoe size in the right field. For example, enter 10 in UK shoe size. The shoe size converter displays the values immediately in other shoe size standards and additionally shows the foot size - you can choose the unit yourself (millimeters/centimeters/inches/feet). Below the table the shoe sizes rounded to 0.5 are displayed - those are found shoe sizes for the US, UK, and EU. The shoe size converter indicates theoretical sizes calculated from the standards. The systems are not fully standardized. The sizes may vary because of differences in manufacturing processes, different allowances, methods of measuring the shoes... It may even differ between countries, though they are using the same Continental European system (Germany, France, Italy). Also, there are several US systems, which vary substantially for sizes far above or below medium sizes. Children shoe sizes are calculated in different ways. As the young ones are growing very fast, some conversion charts take that growth into account, taking e.g., extra 8% length of the foot. The shoe size is then larger than what would correspond to the actual foot length. Not only length but also width is important. For wider feet, the larger size may be required. Check our other clothing calculators: bra size for conversion between EU/UK/US sizes or circle skirt calculator for sewing hobbyists. Shoe Size Conversion can be embedded on your website to enrich the content you wrote and make it easier for your visitors to understand your message.